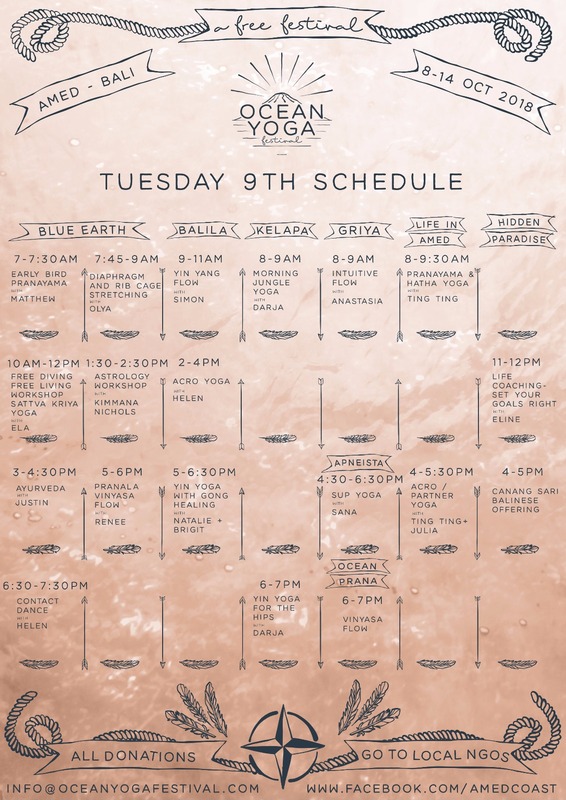 The festival will kick off with an early bird Pranayama at 07:00 am with the Co founder Apneista Freediving and Yoga school/Blue Earth village Matthew, who has “only” been teaching yoga and freediving since 2008 and is a ‘beginner student’ of meditation for 20 plus years. Start the day shining; with breath-work practices integrated into meditation. Different practices will be explored on different days, exploring the connection between the breath, the nervous system and meditation. You will then be spoilt for choice right from the start: if you don’t make it to Blue Earth for 07:45 for a strong core training practice led by Olya, you have two more yoga flow classes starting at 08:00– do you feel like exploring Intuitive Flow with the very diverse Dr Anastasia Belikov (see bio below) at The Griya or Yin Yang Flow with Julia at Life in Amed? At 10:00, back at Blue Earth a Freediver and Sattva Kriya Yogi Ela will lead a 2 hour workshop on Free-diving, free-living workshop. #cosmicmermaid Ela Mare created this workshop as a way to support and deepen your spiritual connection to Mother Ocean through specific #Sattvayoga practices, and take your experience with her depths to the next level. Through different modalities of meditation, kriyas, pranayamas, movement and other tantric techniques, you will be guided into a journey of exploration, surrender and trust learning new ways of mastering depth and breath. At 11:00, at Hidden Paradise, Eline will talk about Breathing- When you own your breath nobody can steal your peace. In this workshop you are going to be aware of your own breathing and how you can improve it. At 14:00, once you’ve digested delicious lunch, Matthew of Blue Earth will lead Roll and Release, a 2 hour workshop on fascial release and deep massage, guided but self-administered, using foam blocks and balls. This workshop will be intense but sweet, opening a door into an aspect of wellness that is accessible to everyone and essentially free. Limited to 35 only, this is first come first served! Shortly after, for Pilates lovers and beginners alike, Anna will spend 90 minutes with a lower body focus for freedivers– to strengthen and align the feet and legs for improved bi -finning technique or simply improved walking (for not yet mer-people). In the meanwhile, at 15:30, don’t miss an intro to freediving at Apneista. Hidden Paradise will showcase the curious Canang Sari- a Balinese offering workshop at 16:00. More choice of Yin Yoga by the wonderful Tingting at Life in Amed at 16:00 and Darja at Kelapa Cottages at 17:00. Make sure you don’t miss the Opening Ceremony at the Blue Earth at 19:00 and stay for an Om Meditation after. Beyond Monday’s offerings (if you missed out or want to come back again! 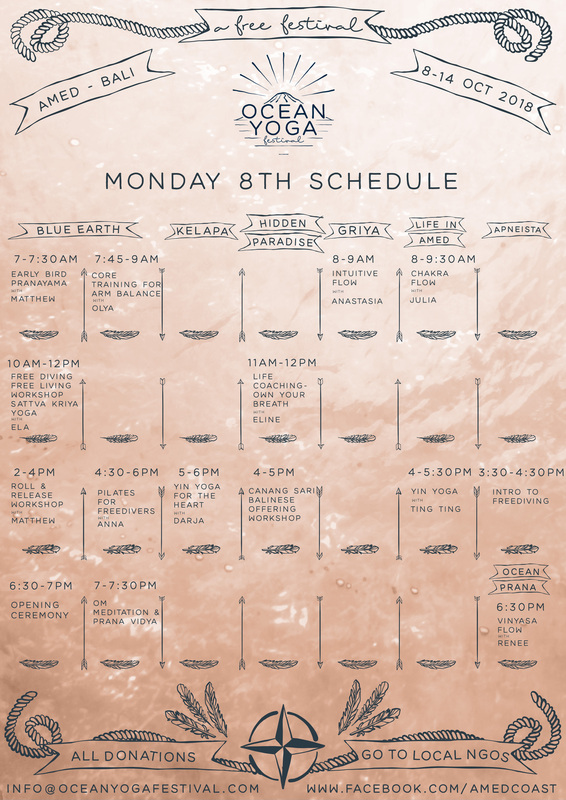 ), the wonderful Yogi and Freediver Darja will be offering Jungle Yoga at Kelapa Cottages at 08:00 and Tingting will lead Pranayama and Hatha Yoga at Life in Amed. 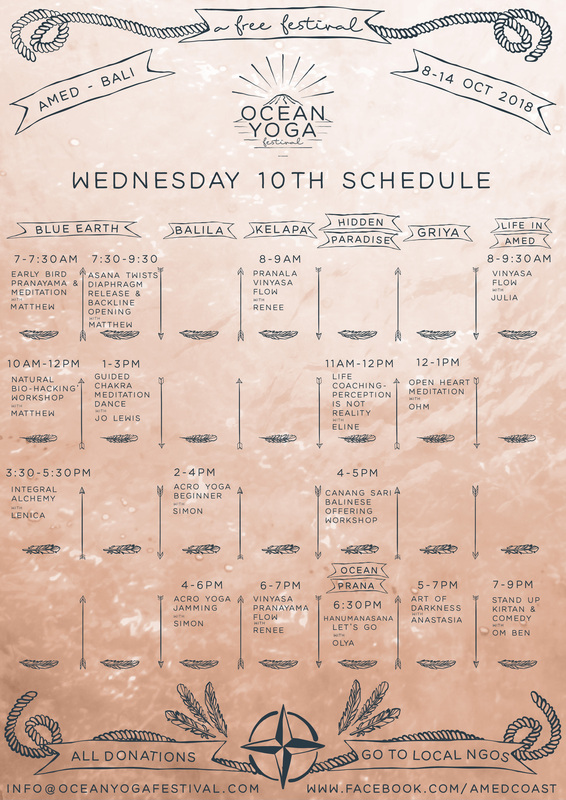 Olya‘s class at Blue Earth at 07:45 will be a Diaphragm and Rib cage stretch – woohoo! No food before + stomachs open, as you will go deep into your diaphragms and intercostal muscles 💪 and somewhat cover Uddiyana and Jalandhara bandhas. Eline will be back at the Hidden Cottages at 11:00 to talk about a slightly different topic- how to “Get the right intention“. In this workshop you are going to ask yourself some important questions, making a connection with the body and mind. Do you want to sit down and experience (think and feel) what you no longer want in your life and form an image of who you want to be? How you can get there, that’s what this workshop is about. Astrology fans and the curious can meet Kimmana Nichols at Blue Earth at 13:30. Balila will host Helena and Acro Yoga at 14:00– a brilliant blend of the wisdom of yoga, the joy and power of acrobatics and the freedom and grace of dance. This beautiful practice cultivates trust, playfulness and community. The essence of Acroyoga is being ‘in the moment’ and in balance with another person. The students will learn the foundations of Acroyoga through games, tightness drills, counterbalancing, partner exercises, basing, flying and spotting. The sense of achievement in a team is always greater. We will rise by lifting each other! For the more contemplative, at 15:00 in Blue Earth, an Ayurvedic Lifestyle Coach & Mentor, Yoga Teacher & Permaculture practitioner & advisor Justin will share his wisdom of Ayrverda: Discovering, Understanding and Applying Ayurveda, (the sister science of Yoga) – Looking from the inside out. This interactive talk will provide information on Ayurveda, (Hindu Science of Life) and oldest healing system in the World, to those seeking either an introduction through to expanding on existing knowledge. Another chance at Acro/Partner yoga at Life in Amed at 16:00 or come receive relaxing vibrations by the ocean at Yin Yoga with Gong Healing at Balila at 17:00. Listen to the sounds of medicinal instruments to drop you out of your minds and into your spacious being and heart presence. For those keen to try a moving surface, head to Apneista at 16:30 to try SUP Yoga. More Yin Yoga at Kelapa or Vinyasa Flow at Ocean Prana at 18:00. For something different, at 18:30 in Blue Earth, come learn the foundations to contact improvisation (communication, listening, creativity, exploration, boundaries) through touch and movement. Here you will be given the tools and safe space to explore and practice what you learn in an open jam after the initial class. Blue Earth will once again be open for the early risers at 07:00- with Pranayama, followed by a new offering at 07:30 by Matthew: Asana twists, diaphragm release and backline opening. This is a workshop exploring the breath in different poses, focusing on twisting poses. We’ll also explore variations of Uddiyanna and Moola Bhandas and Ashwini and Vajroli mudras.. And If you have no idea what those Sanskrit words mean come and find out! A new offering at Kelapa Cottages, Renee will lead Pranala Yoga at 08:00. Julia will also be back with Vinyasa Flow at Life in Amed. Back at Blue Earth, Matthew will present a ‘Natural Bio-Hacking’ 2 hour workshop at 10:00. With sitting room for over a 100 people, we will examine the mind-body connection; look the autonomous nervous system and how neuroplasticity and emotional conditioning connect, drawing on tools from Yoga and Freediving training. This is about 75% theory and 25 % practical explorations. 4. you turn the thought around in different ways and find examples of how that version is also true in the same situation. The Griya will present an Open Heart Meditation at 12:00– this beautiful offering will run every day until the 13th Oct.
For another chance at Meditation, Jo Lewis will guide you through a chakra meditation dance at Blue Earth at 13:00. From 14:00 at Balila, Simon Rodriguez will present two Acro yoga workshops. Driven by him two main passions, move and to understand how the mind works, Simon says that “Acroyoga is a combination of Acrobatics, Yoga and Thai massage. In this session I will be opening the practice to those ones that are looking to connect to this art for the first time. We will explore the “hows” and “Whys” giving you tools to understand what are the seeds of this practice and how can you make it evolve. At 16:00 he will present Acroyoga for seasoned practitioners: This workshop is intended for any one that has flown more than 50 times or based more that 50 times. If you are under that you should come to the Beginners class. This class will give you an idea on what is the meaning Balance, safety, progressions and trust. I will give you the tools to find the middle point between receptivity and engagement. Come join us on a fun but challenging class. Also at 16:00 the cheeky Tingting at Life in Amed will keep Balinese kids entertained and centred at the same time with GRATIS Balinese Kids yoga. Between 17:00 and 19:00 you will be hard pressed to decide between (1) Zen Qi Gong at Blue Earth, (2) the Vinyasa Pranayama Flow at Kelapa and (3) Anastasia presenting the Art of Darkness at the Griya. You meditate; you yoga; you concentrate on the positive, sign your emails ‘with love and light’; you laugh, sing and hug. And yet there are THEM. A pinch of judgement towards someone, jealousy, pride, anger, hatred, helplessness, addictions… – the dark stuff. For a lighter finish to an amazing day, join Ubud’s original Party Monkey, Om Ben at 19:00 at Life in Amed as he merges his two favourite spiritual practices, humour and singing kirtan, in this modern take on an ancient devotional form. Om Ben will teach some simple mantras and lead us in heart-felt, healing songs, interspersed with attempted comedy routines based on his hard-to-believe real-life misadventures. Be prepared to sing, to laugh, and possibly even to cry during what is sure to be a memorable evening! (Please note that due to some potentially adult language and content, parents may want to consider leaving children under the age of 37 at home for this event.). Om Ben is known for his warm heart, quick mind (and quicker tongue), cheeky sense of humor, and adventurous vocal harmonies that are always enthusiastic if not 100% accurate.